The House of Representatives passed May 1 Rep. Birmingham’s bill for state supervision of gas and electric holding companies by a vote of 118 to 72, and sent the bill to the Senate for concurrence (Boston Herald, May 2, 1934, p. 11). Birmingham pushed for passage of his bill during House floor debate, and Rep. Harry D. Brown of Billerica, Republican floor leader, led the opposition to the bill. Under the bill, the power or regulation exercised over gas and electric companies by the state Department of Public Utilities would be extended to corporations, partnerships, trusts, or voluntary associations owning or controlling more than 5 percent of the capital stock of a gas or electric company. Rep. Birmingham introduced a bill that would direct the state legislature to memorialize Congress in favor of federal legislation that would assure states of their authority over intrastate utility business (Springfield Republican, Feb. 5, 1931, p. 15). The Massachusetts Gas and Electric association oppose Birmingham’s bill, arguing that even if the federal legislation were passed, it would not prevent state utilities from asking federal courts to review their cases and that the right of appeal to state courts is very limited. Rep. Birmingham urged passage of his bill to provide that the Registrar of Motor Vehicles inform any person summarily punished of his right to make an appeal within 10 days, during a Feb. 13 hearing before the House Committee on Highways and Motor Vehicles (Boston Herald, Feb. 14, 1930, p. 13). The hearing was held to review legislation that would modify the authority of the registrar of motor vehicles. One bill would prevent the registrar from suspending or revoking licenses until the offenders had been convicted. Another bill would prevent the registrar from suspending or revoking the license of any operator for any minor offense until he had been given a hearing. Representatives of the governor’s Committee on Street and Highway Safety spoke against the legislation. Lloyd A. Blanchard, executive secretary of the committee, warned that the legislation would undermine the registrar’s control and public safety. He said that the bills would permit an offender to continue to drive for months while awaiting trial. “One of the basic fundamentals of the registrar’s duties is the application of summary action to drivers apprehended while driving unsafely,” Blanchard said. Rep. Birmingham spoke March 16 in favor of reconsidering an earlier House vote refusing to order a third reading of a bill calling for a state-wide referendum on the federal Prohibition Amendment (Boston Globe, March 17, 1927, p. 10). However, the House voted 128 to 105 against a motion to reconsider, which was made by Rep. James J. Twohig of South Boston. The vote on the original bill calling for the referendum was a tie, which killed the bill. “A tie vote is the very best argument for reconsideration,” said Rep. Roland D. Sawyer of Ware. Rep. Birmingham filed a report March 5 dissenting from the majority report of the Special Commission on Control and Conduct of Public Utilities (Boston Globe, March 5, 1930, p. 11). Birmingham took issue with the findings and recommendations of the majority report and recommended enactment of six bills to regulate power companies. “The facts presented to this commission prove conclusively that the people and industries of Massachusetts are being forced to carry a heavy burden of unjust charges for electric light and power,” Birmingham said. He highlighted the higher prices charged by Edison Electric Illuminating Company of Boston than those charged by municipal plants. Edison charged $2.13 for 25 kilowatt hours of power, compared to $1.00 to $1.80 for municipal plants in Massachusetts. Birmingham criticized the majority report for not recommending that the state take over direct control of the power holding companies. He recommended that mergers of power companies be forbidden, except with legislative approval. Gov. Alvan T. Fuller held an Aug. 3 hearing at the State House on a petition to commute the death penalty sentence for the carbarn trio convicted of murdering James A. Ferneau during the 1925 robbery of the Boston and Middlesex Street Railway office in Waltham (Boston Globe, Aug. 4, 1926, p. 1, 7). After the hearing Fuller said he directed George M. Kline, State Commissioner of Mental Disease, to have John J. Devereaux examined by two alienists not connected with the case. During the hearing, friends and relatives of the three men – Devereaux, John J. McLaughlin, and Edward J. Heinlein – spoke in favor of clemency. Rep. Birmingham said he had known McLaughlin for 30 years and Devereaux for four years. Birmingham said that Devereaux did not appear normal to him, a condition he blamed on his war experience. Birmingham said he believed that the three men must have been drinking at the time of the robbery. The Legislative Committee on the Judiciary rejected on March 7 a number of bills calling for the abolition of capital punishment, including one introduced by Rep. Birmingham (Boston Globe, March 8, 1927, p. 8). Other sponsors of the bills were Reps. James J. Twohig, C. F. N. Pratt, and Maurice J. Tobin, and Sens. John J. Mulvey and Wendell P. Thore. The committee also rejected a petition from George Washington Chapter, S.A.R., for legislation to define the crime of syndicalism and for fixing a penalty. Rep. Birmingham introduced Dec. 20 a bill that would prohibit future consolidation or merger of gas or electric operating or holding companies unless the legislature provides special authorization (Boston Globe, Dec. 20, 1930, p. 7) . Birmingham also filed a bill to change the law covering the establishment of municipal lighting plants. The bill would allow a community that had voted to establish a plant, if it fails within 150 days to agree with the local power company about the terms of the purchase, to take steps to acquire the plant or establish a plant. Rep. Birmingham introduced May 5 a bill to authorize the city of Boston to borrow $8 million for the reconstruction of accepted streets in Brighton, Dorchester, West Roxbury, Hyde Park, Roxbury, South Boston, East Boston, Charlestown, and Jamaica Plain. Birmingham sent a letter to Boston Mayor Nichols noting that streets in outlying sections should be made safe for automobile and pedestrian use. in the letter, he said that some of the streets were so bad that firetrucks and other equipment were unable to travel over them. Bartolomeo Vanzetti (left), handcuffed to Nicola Sacco (right) in 1923. Rep. Birmingham was one of only six representatives to vote in favor of a resolution asking Gov. Alvan Fuller to appoint a commission to review evidence in the Sacco-Vanzetti case, the Boston Globe reported (April 15, 1927, p 1, 17). The House Rules Committee had recommended against suspending the rules to admit the resolution. Birmingham, along with five other legislators, voted to suspend the rules so the resolution could be considered. The House vote was 146 to 6 against suspending the rules. The representatives joining Birmingham were the resolution’s sponsor, Rep. Roland D. Sawyer of Ware, along with Reps. Tony Garofano of Lynn, C. F. Nelson Pratt of Saugus, Lewis R. Sullivan of Boston, and Charles A. Kelley of Worcester. Birmingham, Sullivan, and Pratt said they voted in favor of suspending the rules because they were opposed to capital punishment. 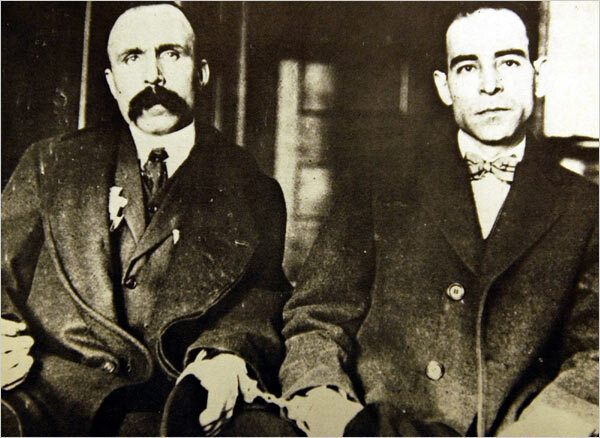 Nicola Sacco and Bartolomeo Vanzetti were Italian-born American anarchists who were convicted of first-degree murder in the killing of a guard and a paymaster during a 1920 robbery of the Slater and Morrill Shoe Company in Braintree. They were sentenced to death by the trial judge Webster Thayer. After a series of appeals and a lot of public controversy, they were executed on Aug. 23, 1927. The governor did end up appointing a three-man commission to review the case, which decided that the verdict and death sentence were justified.